The Level 4 Certificate in Advanced Personal Training gives you the skills and knowledge you need to progress in the health and fitness industry. Stand out from other personal trainers with this exclusive qualification from Entire Training. Designed to take experienced trainers to the next level, graduates of this course have gone on to build successful online personal training businesses and work around the world with leading health and fitness brands. Entire Training is a leading provider of personal trainer qualifications, combining practical sessions at state-of-the-art facilities with guided online study using our own e-learning platform. This course can be completed in just 10 – 12 weeks and can be fit around your existing work commitments and busy lifestyle. Entire Training’s Level 4 Certificate can be taken at venues throughout the country and is available for just £999. There are financial packages available to help with payment so if you’re concerned about finances, please get in touch with a member of our team today to discuss your options. Each trainer that enrols on this course receives a designated mentor that provides hands-on guidance. The course has been specifically created to ensure that all students experience varied learning methods, allowing them to progress at their own pace and convenience. Trainers receive online webinar workshop sessions and are expected to complete an online e-learning course. Entire Training’s tutors encourage trainers to apply analytical research methods which use the latest scientific research. This helps to broaden their skillset and ensures that the industry-wide standard of personal trainer is always being improved. Our experts are on-hand throughout the course to provide professional advice and guidance, offering specialist support when needed. If you have any questions regarding the course delivery or payment options, please get in touch with a member of our team today. For more information on the Level 4 Certificate in Advanced Personal Training course, don’t hesitate to contact the Entire Training team. Call now on 0161 660 6043 / 0203 841 8880 or enter your details online. ▼ Do I need any qualifications before I can apply to do this course? You must hold a Level 3 Personal Training qualification before you can enrol. At Entire Training you can complete a Level 3 Active IQ Diploma in Gym Instructing and Personal Training and qualify for just £999. ▼ How do I pay for this course? Firstly, you need to enrol on to the course via our online enquiry form. One of the Entire Training team will then be able to arrange a call with you where you will be able to discuss the payment options in detail. You can speak to our course consultants on 0161 660 6043 / 0203 841 8880 and they will talk you through your payment options. Entire Training’s dedicated support team provide helpful advice and information to all learners for the duration of the course. Calls from your tutor and the support team will ensure you have all the necessary information required to succeed on the course. Our award-winning tutors have extensive experience working for a variety of clients within the industry, helping them to pass on valuable information to learners. Entire Training use state-of-the-art facilities at exclusive venues and offer payment plans that can help you take your first steps towards becoming a personal trainer. At Entire Training we are committed to raising industry standards through the development of highly trained and motivated fitness professionals. Our aim is to provide passionate fitness enthusiasts with an affordable qualification that will lead to a career they want. The aim is to provide an effective learning environment and support across all our courses we deliver. We carefully select training venues, tutors, resources and support staff that want to see students succeed in the industry. Our goal is to provide the best platform for our students in their journey to a new career ensuring they develop the right skills and knowledge along the way. 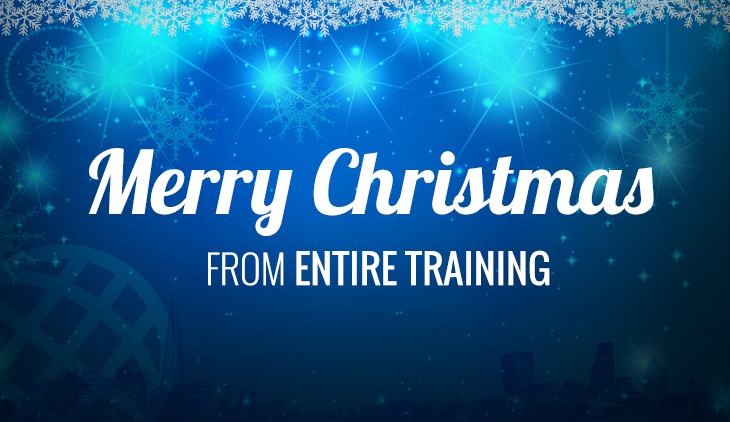 Merry Christmas from Entire Training! We'd love to keep in touch with news and offers from time to time. Please let us know if you wish to receive info and updates from Entire Training.